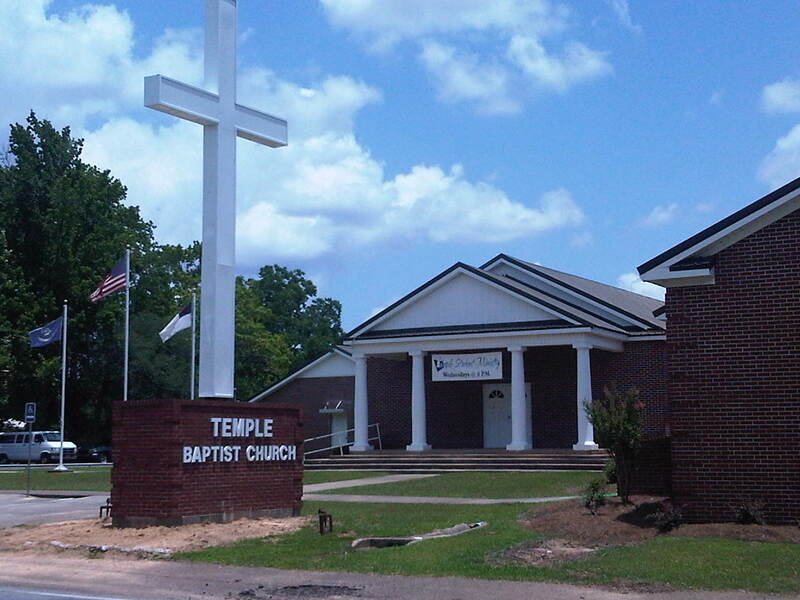 Temple Baptist Church had its original orginizational meeting under a Chinaberry tree on June 9, 1945. Rev. Pharis, pastor of Goodpine Church, moderated. The Church purchased land on July 26, 1945 from Henry H. Powell for $100.00. The Articles of Incorporation and the Church Charter were signed on April 12, 1950. They were filed at the LaSalle Parish Clerk of Court's Office on April 20, 1950. The first trustees were Mr. Van Powell, Mr. Dan Neal, Mrs. Mary Tarver, and Rev. Henry Powell. The first deacons were Mr. Fred Powell and Mr. Van Powell. In August 1964, Mrs. Walter Slay and her sons, Roscoe and Otto, donated property to Temple Baptist Church. This particular land acquision was brought about when the Willis family transferred a portion of their land to East Jena Baptist Church in an exchange that was worked out by the two families and the two churches. The Pre-School Building was later built and dedicated on this property in 1970. The Brooks-Taylor Activity Center was built by the men of the Church in memory of two young men who went on to meet the Lord in 1974. The building was dedicated on September 14, 1975. When the building was completed, a multipurpose facility with 8400 square feet resulted. It consisted of a kitchen, dining area, full size basketball court, stage, bathrooms, and showers. In 2000, the Church added on to the dining area which doubled its size. Temple Baptist Church purchased a parsonage in 1976 and also built staff offices during this time. The church sold the parsonage in 2009. In June 1986, the Church entered into the "Together We Build" program. This financial giving program along with much prayer enabled Temple Baptist Church to proceed with plans to build a new Sanctuary that could hold up to 460 people and provide 8 additional classrooms for a growing Church. Actual construction efforts began on July 13, 1987. On March 13, 1988 at 2:00 P.M., A Dedication Service for the new building was held. On March 29, 1998, Temple Baptist Church dedicated a new library in memory of Micah Erwin. In 1998, Rev. Jimmy Keene and members of Temple Baptist Church founded Temple Christian Academy. The School began with 19 students and 3 for the 1998-1999 School Year. The church converted the Preschool building into useable space for the school. Now, Temple Christian Academy has a full time Principal, Vice Principal, 11 Teachers, 3 support staff workers, a librarian, and roughly 150 students each year. In 2000, the Church built a school building consisting of four additional classrooms. In 2009, the Church retired the building debt and became debt free. In 2011, the Church continued to prosper. Following the Lord, Temple began significant renovations to the Sanctuary, Fellowship Hall, and Library. God has further blessed this effort by providing well over $100,000.00 in additional contributions to the building fund of the church. The church enjoys a brand new library for TCA, a conference room, a renovated children's wing, kitchen/cafeteria, and sanctuary. In 2013, Temple Christian Academy added a new building located behind the gym. It houses grades 6-8 and has helped the school in the continual and steady growth that it has experienced over the past several years. 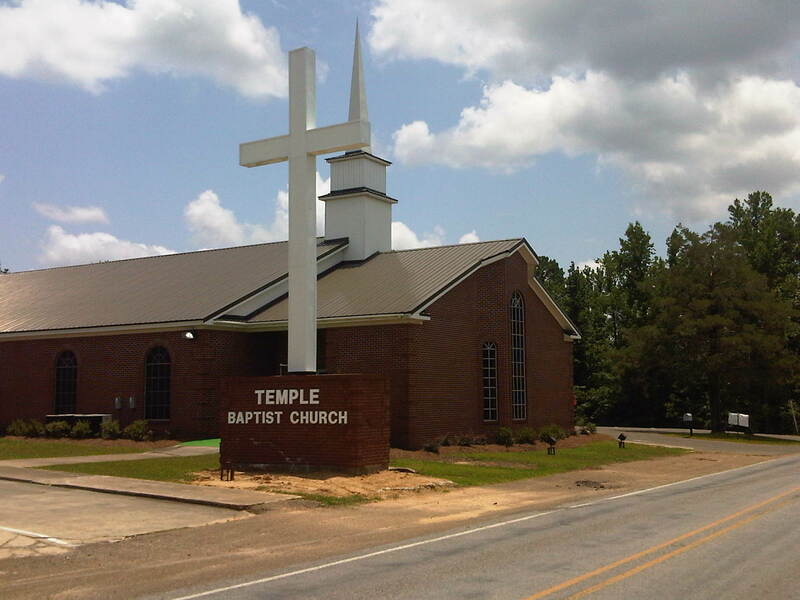 This ministry continues to add spiritual value to the work of Temple Baptist Church. We uphold the Doctrinal positions found in the 2000 edition of the Baptist Faith and Message.